Catastrophic Engine Failure! | Tennessee Aircraft Services, Inc. Suppose: While happily cruising along, your single Teledyne Continental Motors (TCM), big bore, six-cylinder engine suddenly revs past its 2700 RPM red line up to 3500 RPM? The noise from forward of the fi rewall sounds like a giant chain saw, there is a noticeable deceleration in the airplanes’ forward speed, the prop control seems to have no affect, and retarding the throttle enough to slow the engine results in a major loss of thrust. This is a very rare event and certainly not one you’ve likely trained for. So what would cause it, and what happens inside the engine during the six-minute race to the runway? Previous to this catastrophic failure, and for unrelated reasons, the engine was removed for a top overhaul. The engine was then reinstalled with the original propeller and governor. Two FAA certificated mechanics participated in the work, and both confirmed that proper torque was applied to the propeller stud nuts. Three hours were spent trying to get the prop governor set up while the owner waited to take the plane home. After several ground runs and an engine leak check, the owner was handed the invoice and sent on his way. (Shameless disclaimer—this writer’s shop did not participate in the engine work or its reinstallation). About 15 minutes into the flight the engine suddenly rev’d up to 3500 RPM as displayed on the digital tachometer. It then took about six more minutes at 3500 RPM to get to an airport for a safe landing. A quick external inspection of the engine compartment revealed three of the propeller mounting studs had broken off. A fourth had stretched enough that the washer under the lock nut could be rotated easily by hand. The remaining two nuts appeared to be secured. Failure of the studs was most likely a result of being over or under torqued. There was about a 1/8th inch gap between the crank shaft flange and the propeller hub on the side where the three studs had broken. This gap was just enough to release the oil pressure that controls the pitch of the propeller. The oil pressure in the crankshaft is generated by the propeller governor to control the pitch of the propeller blades. Any time that pressure is lost, the pitch of the blades goes to the lowest position. In essence, this propeller became the equivalent of a fi xed pitch prop set at a pitch far too low for a 300 horsepower engine. The TCM engines actually have plenty of experience running above 3500 RPM. The smooth GO-300 in the Cessna 175 runs above 3000 as does the GTSIO-520 in the Twin Cessna 411, 421, and 404. In the case at hand, the engine does not connect to the propeller via a gear reduction which allowed the propeller to spin way past its design speed. When approaching such high RPMs, the engine’s vibrations increase exponentially. Add in some wobble effect from the broken studs and you’ve got internal shock waves that are off the scale. At the beginning of the teardown of this particular engine we didn’t expect to find anything major; after all, the engine taxied the plane up to the ramp just fine. Suddenly this teardown became really interesting, beginning with the oil pan in which we found a hand full of gear teeth, small bolt head, and other steel chunks. 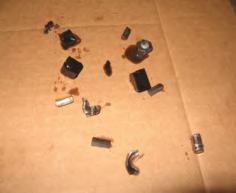 A few of the pieces found in the oil sump. The four bolts securing the alternator gear to the crankshaft had broken and their locking tab plates ventured throughout the engine. 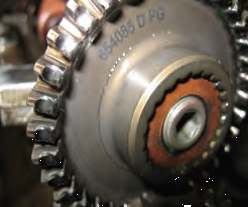 The prop governor gear had moved inboard past the beveled teeth on the camshaft drive gear. 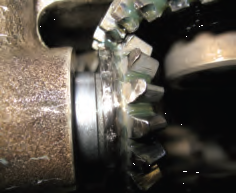 Several teeth were missing from the cushioned alternator gear. We also found, at the rear of the engine, cracked and broken magneto drive assemblies. The tops of the pistons made marks on the inside of each cylinder head, and there were several gouges on the inside of the crankcase where various loose parts impacted. 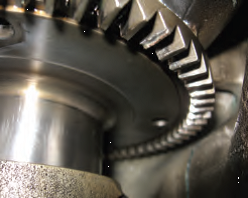 Propeller governor gear moved toward the center of the camshaft gear. 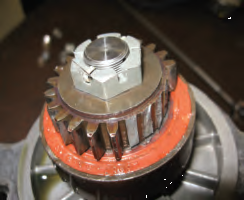 Governor end of gear showing the ¼” it moved into the engine. Alternator drive gear with damaged teeth and bolts missing. Alternator drive gear missing teeth. Including myself, there were four experienced engine mechanics plus the insurance adjuster and the aircraft owner participating in this engine disassembly. We spent several hours trying to figure out the sequence of events: did the prop studs fail first setting all this destruction in motion? The governor gear was improperly installed? Or the alternator gear retaining bolts failed, sending shrapnel throughout the engine? Every hypothesis was met with evidence to the contrary and we continually ended up at the prop mounting studs. Believing the factory had certainly seen this kind of damage before, we called the tech support folks at TCM. We explained the scenario of our engine’s events and asked what kind of internal damage we might expect to see. They told us TCM does not have any documentation of this extreme overspeed. Also, TCM has not experimented with engines on the test stand running at unlimited RPM until they came apart. The only documentation to which they could refer us was their service bulletin SB05-2 for overspeed limitations. SB05-2 begins with a chart showing the rated RPM limit for our engine series is 2400 to 2850. The overspeeds are listed in three categories: Cat I up to 3000, Cat II up to 3300, and Cat III is anything past 3300. All of these categories are further defined with time limits and inspections required. For Cat I and II, it only takes ten seconds to cause concern of internal damage. Consider that the lesser categories are measured in mere seconds; this Cat III lasted several minutes, which is way past anything mentioned in the service bulletin. As far as TCM is concerned, this engine is “toast.” The service bulletin required it be clearly labeled as “removed for excessive overspeed” when returned to the factory. They also require that the engine and all accessories be completely overhauled. Also, replacement of all connecting rods, rod bolts, and valve train components is required without consideration of their wear condition. For me, this is all very fascinating. The dynamics of rotating parts complicated by vibration and power is amazing in what can happen in a short period of time. Of course, the likelihood that any of us will experience an event similar to this one is remote. However, the probability of having some other scary problem caused by the same error is high. Last year I wrote an article for this magazine about proper torque wrench use. At the time I thought it would just be interesting for the readers to know there is actually some skill required to properly use a torque wrench. This particular engine failure serves as reminder that one cannot relax just because a procedure becomes routine. 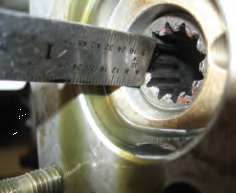 There isn’t a convenient way for you to determine if your mechanic knows how to properly use a torque wrench. You can at least ensure that he/she is using a calibrated wrench and the values applied are documented in the maintenance record entries. A few torques to note would be prop bolts, wheel half bolts, brake calipers, structural attach hardware, engine mount bolts, landing gear mount hardware, and oil filters (yep, oil filters).